Ailing MDC president Morgan Tsvangirai has been placed into an Intensive Care Unit (ICU) at a Johannesburg hospital after he refused to eat for 10 days due to the alleged ill-treatment of his wife Elizabeth by his family, the Daily News On Sunday can reveal. Elizabeth has been barred from seeing her husband by senior figures within the Tsvangirai family who, according to a leaked audio tape, have also seized his diplomatic passport as the factionalism ripping the MDC apart is said to have extended to the former prime minister’s family. The sad developments are said to have contributed to the rapid deterioration of the health of the former PM in the stability-inducing unity government which has driven the MDC to the brink of splitting. Recently, government came to the rescue of Tsvangirai when it deployed armed police guards to stave off the former unionist’s alleged relatives who had wanted to raid his Highlands home of household property. Yesterday, the Daily News On Sunday was told that now Tsvangirai has been diagnosed with a kidney tumour which is in an advanced stage and has grown into the liver. Tsvangirai is under the care of specialist physician and pulmonologist Gunter K Schleicher, who is working with two specialist physicians and a specialist anaesthetist. 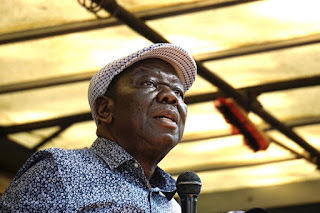 Sources said before Tsvangirai’s health had further deteriorated, he had wanted to travel to Zimbabwe to try and stop the ugly infighting in the MDC but had his passport confiscated by one of his brothers. According to the leaked audio tape in possession of the Daily News On Sunday, Tsvangirai protested the seizure of his passport in a bedside meeting held 12 days ago attended by nephew Hebson Makuvise, his brothers Manase and Collins, sister Dzidzai and his uncle a Sekuru Zvaipa. “Do you know it’s a criminal offence?” an agitated Tsvangirai interjects. “It’s a criminal offence tozviziva (we know),” Manasa shoots back. “Ndipei passport yangu. Ini ndiri kuti ndipei passport yangu (Give me my passport), what’s the problem,” Tsvangirai protests. “Zvauri kutaura iwewe (What you are saying), you are right, isusu we are also right,” Manase insists. “Ndipei passport yangu ndigare nayo. Asi kana mavakuti mavakuita zvamavakuita, ini handichaidi. (Let me keep my passport. If you don’t want with it, then I don’t want it anymore,” Tsvangirai said in the tape. Family spokesperson Makuvise told the Daily News on Sunday yesterday Tsvangirai cannot return home because he was undergoing treatment. “Uri kupi Tsvangirai, (where is he) he is detained in hospital. Munhu anonzi ainde Zimbabwe achigwara (They want him to return home when he is sick),” he asked rhetorically. After that confrontation, coupled with the barring of his wife, the Daily News On Sunday understands that Tsvangirai then refused to eat. His health deteriorated sharply and doctors who examined him reportedly told the family that the hunger strike was threatening to do permanent damage to his organs. He was then carted into the ICU. and put down direct defiance of his order. The MDC is being devoured by factional fights which have intensified ever since Tsvangirai hinted that he was thinking of quitting active politics due to his failing health. The once-dogged labour union leader has been in and out of South African hospitals for cancer of the colon treatment in the last months. As his health continues to worry his supporters and family, his senior officials in the MDC have been going at each other hammer and tongs with different factions punting their preferred candidates to succeed the former PM. On Thursday, the infighting within the MDC degenerated into comical scenes as the VPs publicly clashed while Tsvangirai’s spokesperson, Luke Tamborinyoka, was forced to call an urgent press conference to tell journalists that he was still in charge of communication and had indeed been instructed by the former PM in the inclusive government to communicate the appointment of Chamisa as acting president. Tsvangirai’s family on Friday came out backing one of the MDC vice presidents Elias Mudzuri who insists that he’s in charge of the party in the absence of the former PM. Mudzuri, 60, on Friday also claimed to have seen Tsvangirai at the top-notch 190-bed top-notch Wits Donald Gordon Medical Centre (WDGMC) in Johannesburg, South Africa and claimed he was still the acting president. “I had the privilege of meeting president Tsvangirai. Meeting him again today. I am still the acting president until his return. Please stay focused on strengthening the party and winning elections. Ignore falsehoods. Victory is certain,” Mudzuri said on microblogging site Twitter on Friday. His claim was backed by Tsvangirai’s eldest son Edwin during an interview with South African Broadcasting Corporation. However, another Tsvangirai’s son Vincent told the Daily News on Sunday the hospital has dramatically tightened the rules on his dad’s hospital visitors since he slipped into semi-consciousness. “VP Mudzuri is lying. My dad is currently not receiving any visitors. He has not seen anyone in the last 48 hours and will not see anyone in the next 48 hours,” he said. Apart from being worried by ugly MDC factional fights, Tsvangirai has had to watch his wife being denied access to him by his relatives. Last week, our sister paper, the Daily News, exclusively revealed that Tsvangirai’s family members were refusing to allow Elizabeth, to see him at the WDGMC. Close relatives of the MDC leader accuse Elizabeth of backing Chamisa to succeed Tsvangirai and fear she could put pressure on him to facilitate his ascendancy to the throne without following the party’s constitution. Tsvangirai’s wife enjoys cordial relations with the youthful acting MDC president.